TransLite Nevoscope is a patented* skin examination microscope with a special transillumination and surface lighting device, and optical lens for visual examination of skin lesions. The light source is a bright halogen lamp with variable intensity control and light is channeled through a flexible optical guide to the light ring in the front of the Nevoscope where it is directed onto the skin. Nevoscope has three modes of illumination for total illumination of the skin and subsurface structures: transillumination, surface illumination and epiluminescence. The combination of simultaneous transillumination and surface illumination produces ‘No Oil’ epiluminescence imaging of lesions. The amount of surface light can be controlled so as to produce unique enhancement of subsurface pigmentation. Conventional surface imaging of the skin is achieved by the use of a special spacer in front of the Nevoscope that lifts the ring light a few millimeters above the skin. The area of interest is uniformly illuminated by the fiber optic ring light. 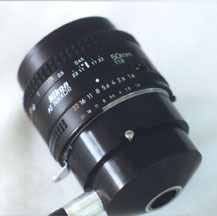 Nevoscope showing the ring light for transillumination and the interchangeable magnification lens. The Nevoscope is designed to fit comfortably in the hand. Focus, and surface light controls are easily accessed. The optical lenses are interchangeable for different magnification. Nevoscope can be configured with several different options. The basic unit is the optical imaging device with interchangeable magnification lenses. Nevoscope can be attached to film cameras, digital cameras or 8 mm video camcorders to capture images for patient records and archiving.